Author(s): William Gray DeFoore, Ph.D.
William DeFoore provides practical solutions to one of society's most pressing concerns-anger and rage. His practical ten-step approach offers a way to reach a new level of psychological and physical health by learning to deal with anger in healthy ways. Through gripping stories, research and narrative, DeFoore explores the many faces of anger, including passive anger, anger during the grief process, anger among males, and anger that can actually help us connect with our spirituality and life purpose. This edition has added new chapters that cover anger in women, anger in children, in school, in the workplace, and domestic violence. Sam had a look of indignant rage in his eyes. The lines of his face curved and formed outlines of his anger, which seemed to flow from his eyes in streams. He was hard to look at. It would have been easy to feel afraid or guilty, looking into those accusing eyes. When he spoke, I was amazed to hear his mild tone and pleasant voice. It was as if the angry eyes had been lying. His words told the story of a passive man, afraid of his twenty-two-year-old son, afraid of his wife and afraid of facing what he had done to create the misery in his family. Sam's words told me nothing of the anger in his eyes. He was at war, all right—with himself. 'At times,' he said, 'my chest burns as if there is a red-hot iron piercing my heart.' Sam was all-too-well armed with guilt and anger at himself, and his body was the battleground. In the battle with his wife and son, however, he was unarmed. He was a helpless victim. At least, that's how it seemed to him. Sam hated his anger. But he couldn't make it go away. It just got stronger and more disturbing. It turned into rage, which began to show up in his son Joe. The rage that was growing in Sam and his family was about to destroy his home. Most of us find ourselves exploding from time to time and regretting it later. The explosions occur because we don't like our anger and we try to keep it inside. It works like a pressure cooker. We can only suppress or apply pressure against our anger for so long before it erupts. Periodic eruptions can cause all kinds of problems. At Sam's house, the pressure cooker was about to blow. No one had 'let the steam out' in a long time. The last pressure release had been six months ago when Joe had taken a neighbor's car and run it off a bridge. Joe wasn't hurt, but the car was a total loss. Of course, Joe's parents paid for it. And paid for it. And paid for it. They always paid. But at least the pressure was off—for a while. It only took a few more months for Joe to reach a boiling point again. He just wasn't as good as Mom and Dad at stuffing feelings. It seemed to be his job in the family to let the steam out of the family pressure cooker. This time he really blew the top off. Sam and his wife, Margaret, had been out of town visiting relatives for the weekend. They had been very nervous about leaving. As a matter of fact, this had been their first trip together for pure pleasure in quite some time. They were usually far too worried about Joe to leave home for long. Their two daughters were grown, and it seemed now that Joe was all they could think about. As they were driving home, they were quiet. Each was wondering what their son was going to do next. As they turned down their street, they heard the sirens. Without knowing why, Sam and Margaret looked at each other and panic filled their eyes. They didn't say a word. Then they saw their house in flames. They looked where he was pointing and saw Joe sitting on the ground poking at something with a stick. The look on his face didn't make any sense. You would never have known from looking at him that his family's home was burning down just a few hundred feet away. As they approached they saw that what Joe was holding wasn't a stick. It was a large kitchen knife. On the ground in front of him was a family portrait showing him and his mother with their arms around each other. His father was off to the side with his arms around his two daughters. Everyone in the picture was smiling except Joe. He was stabbing the family portrait while his house was burning. But he didn't feel any pressure. He had started the fire. Maybe you believe you don't have any anger. You may feel that you have succeeded in stuffing, controlling or stifling that unpleasant part of yourself. This would work fine if there weren't a fire under the pressure cooker. But there is. Everything we are learning about emotions and health tells us it is unhealthy to stuff feelings. Reports by Reuters Health, 2000, and Vanderbilt University, 1999, for example, indicate that anger suppression may boost blood pressure and/or contribute to depression. Your efforts to control your anger may be hurting you. If you don't blow like an overheated pressure cooker you may have an internal explosion. This usually means depression, self-hatred, major illness or all three. WHO COULD POSSIBLY LIKE ANGER? With all of the abuse and conflict in the world, it seems anger is the problem, certainly not the solution. Victims of abuse, perpetrators of abuse and rescuers of abusers all have problems with anger—their own and others. When it comes to abuse, it seems anger is the bad guy. Anger is usually expressed in ways that make someone a victim. Because of this we often get anger mixed up with aggression and attack. Most people believe anger is just plain bad and the world would be a better place without it. This reminds me of a speaking engagement I had a few years ago. I requested, 'Somebody give me a definition of anger.' I love asking this question. Most people don't know what anger is. We think about it, talk about it, feel it and act on it. But we don't know what it is. 'Rage!' from a woman in the back of the room. I could see it in her eyes. 'Violence' was offered by a small, quiet man in the front row who had one of those strained but permanent smiles on his face. 'Losing control' was the definition proposed by a dignified man in a business suit. 'How do you think the dictionary defines anger?' I challenged them one more time. 'Bingo! That's it! It's just an emotion. It doesn't hurt anybody,' I said, enjoying the looks on their faces as they heard this for the first time. No one disagreed. They never do. It was as if they knew, but didn't know that they knew. When we are afraid of losing control, it's not anger we are afraid of. The wild, destructive force we sometimes feel inside is rage. Rage is a mixture of unexpressed pain, fear and anger that has been building up over a long period of time. It results from being hurt and scared and keeping all the feelings inside. If we return to our story about Sam and his family, maybe we can learn more about the results of suppressed rage and the fear of losing control. In my counseling sessions with Sam, I made my best effort to ignore the look in his eyes and concentrate on his words. I didn't yet understand the story his eyes told. I thought I'd better listen and see how he explained what was going on behind those eyes. I learned that Sam was the son of a chronic compulsive gambler and had grown up in a very mixed-up family. His mother was a rageaholic, and the target for her rage was his father. Sam had continued to be passive and to control his emotions throughout all of his adult life. This had been necessary in his childhood, but it just wasn't working anymore. In his current family something else was called for. His son needed him to be strong and take charge of the family, and Sam didn't know how to do it. Joe needed the security of knowing that his dad was in control. Without realizing it, Sam had suppressed his strength and power along with his anger. The rage Sam had seen and been hurt by in his past was a sick distortion of anger mixed with pain and fear. When he suppressed his anger, he lost his ability to claim his strength against anything that threatened him or those he loved. There was no 'tough' in his love. Sam felt totally powerless over the situation at home. As long as he hated and suppressed his anger, he indeed was powerless. After their house burned down, Joe began exhibiting violent rage with threats to hurt himself and his parents. It occurred to me in therapy sessions that Joe was expressing his father's rage along with his own. He was unconsciously 'picking up the slack' for his dad and expressing the rage inside the older man that had never surfaced. Joe began abusing alcohol, which seemed to reliably trigger escalating rage attacks. This was occurring all too frequently. Sam's fear of losing control was causing him to do just that. By suppressing the anger and rage of a lifetime, he had given up his power to gain control over the forces that were destroying his family. Joe had taken control of his family because he was the only one who released his anger. His parents' fear of his and their own anger was the other part of the equation. This gave him power, however unhealthy it may have been. The only problem was that Joe was too young to be emotionally in charge of his family. He abused his power and his family as well. He hated himself for what he was doing, but he didn't know how to stop. He needed his parents to take control so that he didn't have to. • Anger is an emotion, and all emotions are okay. • We have to have anger to survive in a world that is sometimes dangerous, abusive and cruel. • Anger is a powerful feeling that is natural and exists only for the purpose of self-preservation. 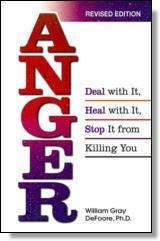 • Anger is emotional energy that we can use to create and maintain healthy boundaries. • Anger does not have to lead to aggression or attack. • Anger does not have to hurt anyone. • Anger is energy and strength to be used for powerful action. • Anger is based on love. ©2007. William DeFoore. All rights reserved. Reprinted from Anger. No part of this publication may be reproduced, stored in a retrieval system or transmitted in any form or by any means, without the written permission of the publisher. Publisher: Health Communications, Inc., 3201 SW 15th Street , Deerfield Beach , FL 33442. WILLIAM G. (BILL) DEFOORE, PH.D., is a psychotherapist, executive coach and president of the Institute for Personal & Professional Development in Irving, Texas. He speaks and conducts workshops internationally on emotional intelligence in personal and business relationships. Through his work, Bill helps individuals and organizations bring body, mind and spirit into an integrated focus, leading to enhanced levels of personal and professional integrity. He is the coeditor and contributing author of The New Bottom Line: Bringing Heart and Soul to Business and Rediscovering the Soul of Business: A Renaissance of Values.